Asfeld Construction Incorporated was started in 1981 when Dennis Asfeld started it with his knowledge of concrete and custom home building. His father Norb joined the company shortly after and was a partner until he retired in 1998. In the early 90’s Dennis saw poured walls being marketed at the World of Concrete exhibition and knew this was the future of concrete foundations. He went home and invested everything he had into changing his company into a new, poured wall company. Dennis was one of the first five contractors in the metro twin cities area to start this new technique. Now poured walls are the normal type of concrete foundation. 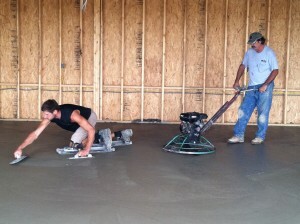 Before Norb retired he spent his last few years teaching his grandson Ben, Dennis’ son how to finish concrete. When Ben graduated high school he was already a talented finisher, but wanted more knowledge in construction so he went to University of Wisconsin Stout and graduated with a degree in Construction Management. In 2004 Ben saw that stamped concrete was the future like his dad did with poured walls. They took a class and learned this new technique. After Ben graduated in 2006 he was eager to use his artistic abilities in concrete full time again. He then took a couple of advanced classes teaching him the art of Concrete Countertops and Decorative Concrete Finishes. This is where he learned new stamping and staining techniques, along with cast-in-place and pre-cast concrete countertops and sinks. This knowledge gave him the opportunity to take a job with a local contractor who is nationally known for his decorative work. He worked there for a few years where he was able to glean a wealth of knowledge and a lot of great on the job experience working with stamped and various decorative concrete techniques. He then became partner with his Dad of ACI and today they are a team of old school knowledge mixed with new decorative techniques and together have more than 50 years of combined experience.